Viewing post in I'm in! Feeling pretty confident I'll have this ready for the deadline. The initial idea was a geometry wars type shooter with novel terrain, however as I get a feel for the gameplay shooting things doesn't seem so important. My goal is to flesh out 2-3 planetoids with portals between them - possibly with maguffins scattered on each planet that unlock the gates - and a timer on screen that ends when every one is found for speedrun replay-ability. Left a duplicate constraint update script on the player object, turned out it prevents terrain clipping at higher speeds. Fixing that had been on my todo list. It's still possible to clip into the interior or escape orbit - not going to sweat it for the jam . 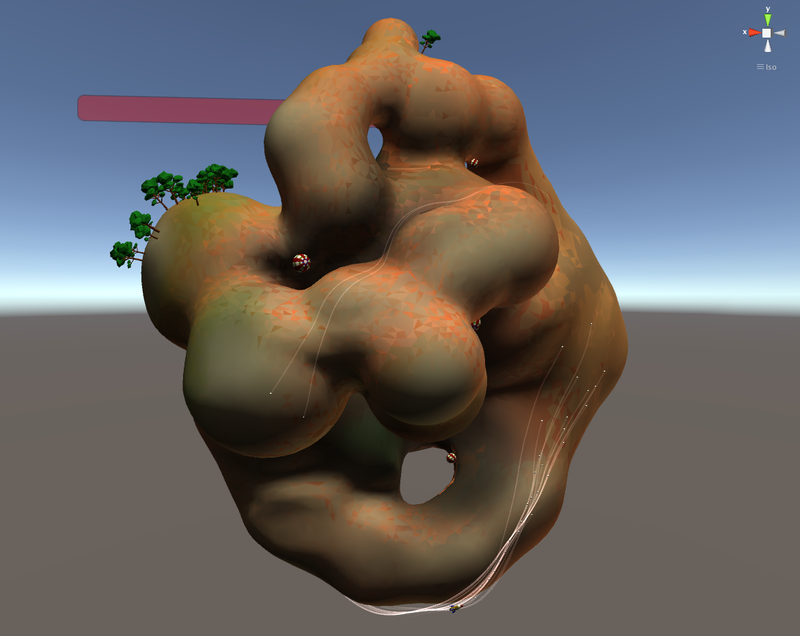 Blender's metaballs were perfect for making a fun surface. Especially handy for creating donut topology - normal sculpting tools have trouble with that. The arches in the terrain really show off the mechanics - thinking another level could be a inverted normal cave system with severe lighting changes.